M33 has always been a nemesis of mine. It seemed that something always went wrong when I'd try to image it, tracking would go haywire, focus would shift or I'd run out of time and have to cut the session short. This image falls into the last category as I had another target in mind and started collecting data only to have it move into an area of light pollution. 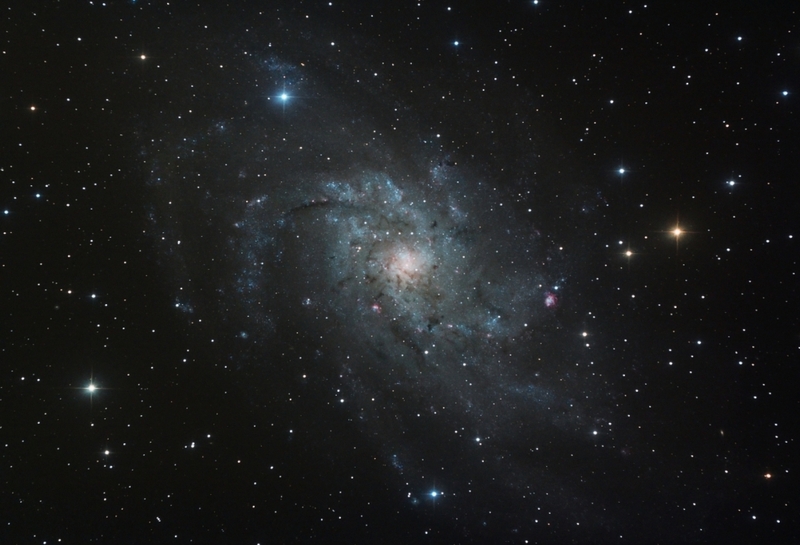 I thought I'd give M33 another try as it was nice and high in the sky at the time. The total exposure was shorter than I would like so I had to limit the stretch a bit, but it qualifies as my best shot of this object to date. This is the first time I've been able to resolve deep sky targets in this galaxy, use the buttons below the image to view 100% crops of several of the brighter nebulae. Move your mouse over the image to return to the original image. Click on the original image to go to a 50% scaled version on my PBase gallery. Processing This image was processed in Images Plus 5 and touched up with Paint Shop Pro. Calibration, stacking, DDP, sharpening and masked contrast enhancement in Images Plus. Masked noise reduction, sharpening and contrast enhancement applied in Images plus beta 5. Image binned and cropped then a star reduction applied.